How Long Does it Take to Get Dental Implants in Fort Worth? Dental implants in Fort Worth are a comprehensive tooth replacement that provide unparalleled stability for your new smile. Wondering how long you can expect the procedure to take? While the total treatment time can vary depending on a few factors, Dr. John G. Boyd says the dental implant procedure lasts about four months, on average. That’s usually enough time to place each implant, wait for them to grow together with the jaw bone, and then restore the implants with a new, sturdy tooth replacement. Take a few minutes to watch Dr. Boyd’s video on the topic, then keep reading to learn even more about the timeline for your dental implants. If tooth loss is recent, the dental implant procedure begins with the surgical placement of each dental implant. It’s a simple outpatient procedure that takes place in a specialist’s office — Dr. Boyd will make a recommendation for a trusted local oral surgeon. After the dental implant(s) have been placed, a healing period of three to four months is necessary for the jawbone to heal together with each implant. The process, known as osseointegration, provides unsurpassed stability for the new tooth replacement. After the dental implants have integrated with the jaw bone, they are just as stable as any other bone in your body. 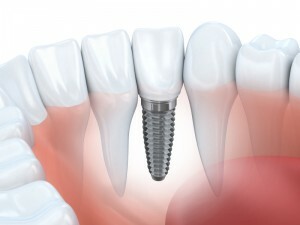 Restoration of the dental implant(s) takes place after osseointegration has occurred. Each implant is re-exposed, and a connecting abutment is placed on top. After one more brief healing period, the abutment holds the new teeth securely to the dental implants. Here’s what the typical dental implant timeline looks like. Patients who have dealt with tooth loss for many months or years may have already experienced significant bone loss due to the missing teeth. Our bones need stimulation to thrive, and each tooth’s root provides this activity for the jawbone. Without it, the jawbone’s volume gradually decreases, causing the sunken, aged look we associate with tooth loss. Patients who have experienced bone loss can still benefit from dental implants, but they usually require an initial bone augmentation procedure before their dental implants can be placed. A sinus lift or bone graft boosts volume in the jawbone to make for a stable anchor for the dental implants, but these procedures add months to the total treatment time. Are you interested in benefitting from dental implants? Dr. Boyd provides quality tooth replacement at West 7th Smiles. Schedule an appointment to find out about your eligibility for the procedure from your dentist in Fort Worth! Comments Off on How Long Does it Take to Get Dental Implants in Fort Worth?